How Important Is Your Personal Statement for Transitional Residency Programs? Many residencies will require you to take a transitional year program before you begin your actual specialized training. While in some instances this is part of the program you are applying to for some you will require a separate application to a dedicated program. The need to complete a transitional year makes the dedicated programs highly sought after and thus very competitive. Your transitional year personal statement will often be the most important part of your application. You will almost certainly have excellent qualifications but they will be very similar in many ways to those you will compete with for a place. The personal statement transitional year residency is therefore often your only way of showing why they should be selecting you rather than any other. 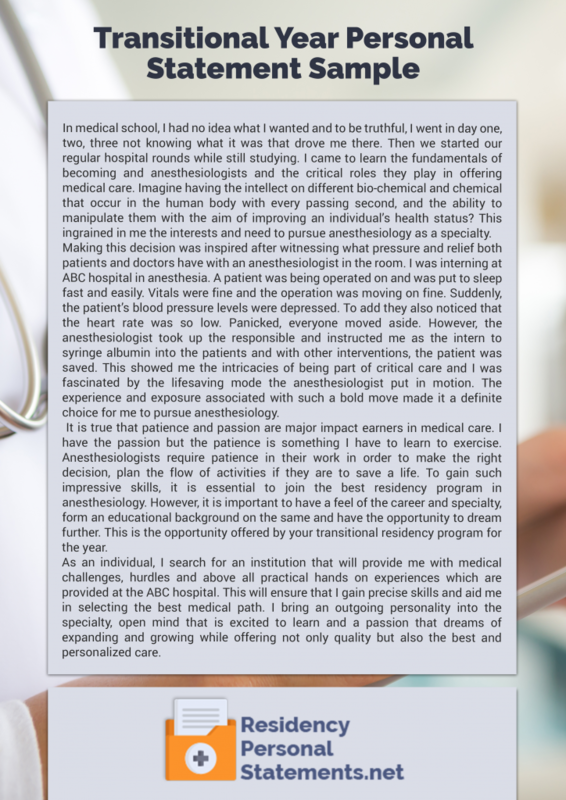 How to write a great medical residency personal statements? Writing an effective residency application personal statement is never an easy task no matter where you are applying. It must be done with great care in a way that is going to get you noticed. Our services have been helping students with their applications for several years and we can provide you with professional advice and support to make your personal statement for a transitional year a success. What Is the Difference between Transitional, Preliminary, and Categorical Residencies? These residency programs include a yearlong internship to gain the required skills and experience within the overall program. So you will apply for one residency and stay there throughout your training. Applying for a categorical year match is often the preferred route for many applicants but not every program offers this for every specialty. These offer a full year of training across many rotations so that you will be able to learn the required skills for your final specialism. These programs are also useful to those students that are still unsure of what they wish to pursue or that have failed to get directly into a specialist residency. These are similar to transitional residencies but will further split the training into either surgery or internal medicine preliminary years. What Programs Require a Transitional Year? Get some advice on how to avoid mistakes in your medical resident resume writing! Where Can You Apply for Your Transitional Year? Colorado Health Foundation Presbyterian-St Luke’s Medical Center Program: this program is specially designed to offer a full year-long training across a wide range of different areas of clinical medicine to prepare them for their specialty. Memorial Sloan-Kettering Cancer Center Program: this 4434-bed hospital provides a transitional year training through 12 departments for just 24 residents every year. Scripps Mercy Hospital Program San Diego: this transitional year residency is very proud of the fact that many of those that participate then go onto be placed in highly competitive residencies. Presence Resurrection Medical Center Program: based in Chicago and with a very busy emergency department and an excellent open heart surgery program this is a great place to complete your year. Crafting an effective statement that will get you noticed is not an easy task. The following tips, however, will support you in ensuring that you get yours written in a way that will give you the highest chance of success. Here are tips for the residency interview. Tailor your personal statement so that it reflects specifically what the program wants to see from an applicant. Use a transitional year personal statement sample to see how others have approached their writing: do not, however, copy anything that you read. Write about your specific reasons for applying to them and give them a clear idea of where their program fits into your long term goals. Do your homework and mention specific things about their program to show that your interest is serious. Write about experiences that are irrelevant or too far in the past. Use clichés within your writing: always try to be original. Use language that will be difficult to understand. Lie or plagiarize within your statement. Fail to proofread your statement. Whether you are writing a future long term plans essay for medical school or a transitional residency personal statement our services can help you. We provide expert support through fully qualified staff that know precisely what the admissions committee will be looking for. All of the writing support that we provide will always result in perfectly tailored writing that will be unique to you. We always deliver our help on time and every document is provided with a free plagiarism report after our fully certified proofreading services. With full satisfaction money back guarantee there really is no reason not to use our support. 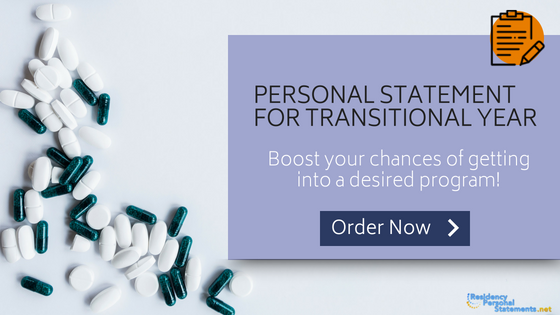 Contact our highly skilled and effective writers here today to ensure that your transitional year personal statement will get you noticed.